"Covered with gold and surmounted with two golden Cherubim facing each other, the Ark of the Covenant must have been an awesome object to behold. But it was what lay inside that made it the holiest - and most powerful - of religious objects"
The Ark was built to contain the tablets of stone on which God had inscribed the Ten Commandments and, as such, was believed to wield supernatural powers. The Bible describes how, blazing with fire and light, it inflicted cancer like tumors and severe burns on the enemies of Israel, levelled mountains, stopped rivers and laid waste to whole cities. It was the biblical equivalent of the atomic bomb. But, between 900 and 500BC, the Ark vanished from Jerusalem's First Temple - it's purpose built resting place since King David conquered Palestine and created Israel around 1000BC. With no mention of the Ark and its whereabouts made in the scriptures, its 'loss' is regarded as one of the greatest mysteries of the Bible. But not to the Ethiopians. The Ethiopian Orthodox Church worships a relic which they believe to be the true Ark. It rests in the Church of Saint Mary of Zion in the town of Axum. It is protected by a Guardian - a Coptic priest who never leaves it side, and never allows any one to see it, not even the Emperors of Ethiopia. The country's other 20,000 churches keep a replica of the Ark, in a room known as the Holy of Holies. Indeed, a church without one is considered unconsecrated. Best selling author Graham Hancock first heard of the legend in 1983, while writing a book about Ethiopia. He found the earliest account of the Ark coming to Ethiopia written in a sacred book called the Kebra Nagast , or the Glory of Kings. 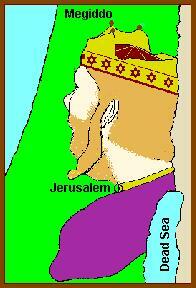 The book tells how the Queen of Sheba conceived King Solomon's child while on a visit to jerusalem. On her return to Axum, she gave birth to a son, named Menelik. Some 20 years later, Menelik visited Jerusalem and spent a year at his fathers court. On his departure, he stole the Ark and carried it off to Axum. During his initial visit to Ethiopia in 1983, Hancock made a point of visiting the chapel in Axum, and asking the Guardian about the legend of the Ark. "It was brought to Ethiopia, to this sacred city... here it has remained ever since" the Guardian told Hancock.Could it possibly be true? After leaving Axum, Hancock decided to find out if the story had any substance. His investigation, at first, did not prove promising. Professor Richard Pankhurst, a leading historian on the area, told Hancock that while the legend of Solomon and Sheba had an ancient pedigree in Ethiopia, Sheba had almost certainly come from Arabia, not Ethiopia. More damming was that Axum did not exist when Menelik was alive. In fact, it was not founded until the 3rd century BC - about 700 years after his death. Hancock put his quest on hold, but he remained intrigued by the fact that there could be a grain of truth in the legend. Seven years later, he resumed his search for the Ark by going to the primary source of data - the Bible. Scrolling through a hi-tech computerized version of the Old Testament, he found more than 200 references to the Ark up to the reign of Solomon (970-931 BC). it was not mentioned again until around 620 BC, when two passages seem to convey that it was no longer in the First Temple. In other words, there is a period of slightly more than 300 years during which the relic could have been spirited away. Using a powerful 'search and find' tool on the computer, Hancock looked for words, or sequences of words, that had only ever been mentioned with the Ark earlier in the text. His reasoning was that any occurences of these phrases during the three centuries that the relic was not mentioned would constitute powerful, indirect evidence of it's whereabouts. By using this technique, Hancock was able to establish that the Ark had probably remained in the First Temple until at least 701 BC. This meant that it could only have gone missing in the relatively brief 80-year period between 701 and 620BC. Born in Edenburgh, Scotland, on 2 August 1950. Studied sociology at Durham University. Moved to Nairobi, Kenya, in 1981, where he was East Africa Correspondent for The Economist. In 1983, he began investigating Ethiopia's claim to possess the Ark of Covenant. His book The Sign and the Seal : A Quest for the Lost Ark of the Covenant was published in 1992, and went on to become an international bestseller.